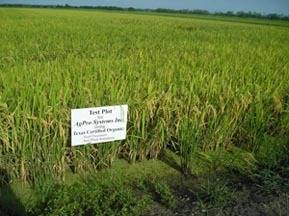 This rice program is intended for informational use only. For the best possible results tailored to meet your needs and soil type, check with your AgPro™ representative for specific recommendations. 32 oz AIM per acre Stimulating microorganisms in preparation for planting These are water management tools that aid in air and water exchange critical to stimulating microorganisms in preparation for planting. RECLAIM also detoxifies and flushes harmful effects of sodium or carryover herbicides.NOTE: *For pH higher than 6.8 and/or high sodium content. Also good for chemically damaged fields. 2-4 weeks Post Emergent:8-12 oz RENEW per acre Stimulating plant to tiller and promote strong growth The application of RENEW will stimulate organisms creating an environment promoting a bigger root system and faster growth in the plant. It will stimulate the plant to tiller out increasing the plant stand and potential crop yield. 16 oz SS 9 per 100 gallon tank mix with fungicide Ingesting nutrients RENEW and SS 9 stimulates the plant to higher health thus high yield potential. SS 9 helps make the fungicide and/or insecticide act in a systemic way for longer control. 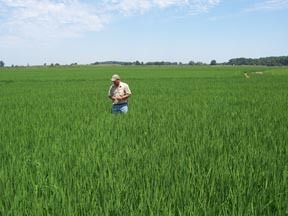 We strongly recommend using an adjuvant with your rice spray program. AgPro™ specialty surfactants (SS 9, SPREADER STICKER, phLAME) have proven cost effective with spray applications of chemicals (fungicides, herbicides, pesticides) to allow lowest label rates with better results. The synergy can add potency and extend the chemical life and have allowed some growers to experiment and get exceptional results with well under label rates.